We recently built a brand new home for Nicki Stewart and her family, whose previous home was devastated by termites after inspections failed to identify them. 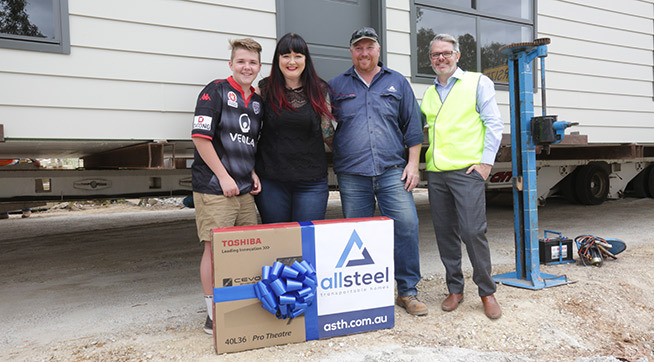 "After discovering our family home was completely destroyed by termites, we were determined for this to never happen to us again – so we decided we couldn’t go past Allsteel!" This Today Tonight story showcases the delivery of their new home, and the generosity of local businesses who banded together to help her out. Now Nicki and her family can live with peace of mind, knowing that their Supaloc steel frames are 100% termite proof. "In what has been an extremely stressful time in our lives, Allsteel have made the process a breeze. After living in cold damp shipping containers for the last 7 months, we can’t wait to get into our new home ‘The Rosemont’ later this year." We wish them all the best for the future and we hope they enjoy their new home for many happy years to come.